China Glaze Crackle Metals offers six shades of metallic crackle polishes, and while I was tiring a bit of the whole crackle fad, these have reignited my interest. 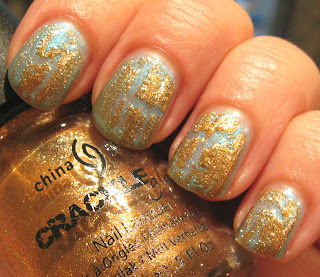 They're sparkly, glittery, easy to work with, and offer some shades that haven't been done before in a crackle formula. 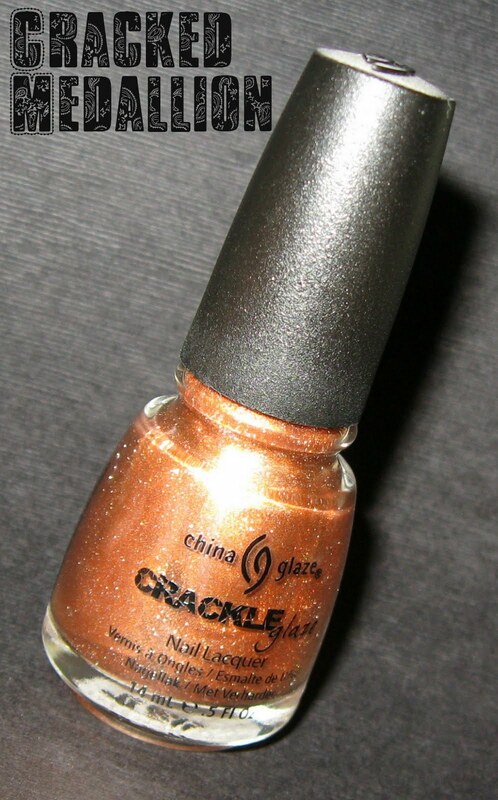 I chose Cracked Medallion for my first Crackle Metal review because I was excited about a possible copper color from the promo pictures, but this is more of a golden bronze with a hint of pale copper in reality. My base color was three coats of Sally Hansen Blizzard Blue, from the Xtreme Wear line. This was going to be my nail of the day, until I realized that after three coats and still many bald areas, that at least two more coats would be necessary. The nice thing about crackle polishes is that they're great to use on a failed base color! It's too bad Blizzard Blue is so sheer, because it's a beautiful light turquoise with iridescent shimmer that glows from within. This is one coat of Cracked Medallion over Blizzard Blue. I found the formula on this to be very easy to apply, unlike some of the creme crackles. I did add a top coat because they dry to a fairly matte finish. The first photo was taken outside under cloudy skies, while the second photo was taken indoors with no flash. Macro shot of the finish. 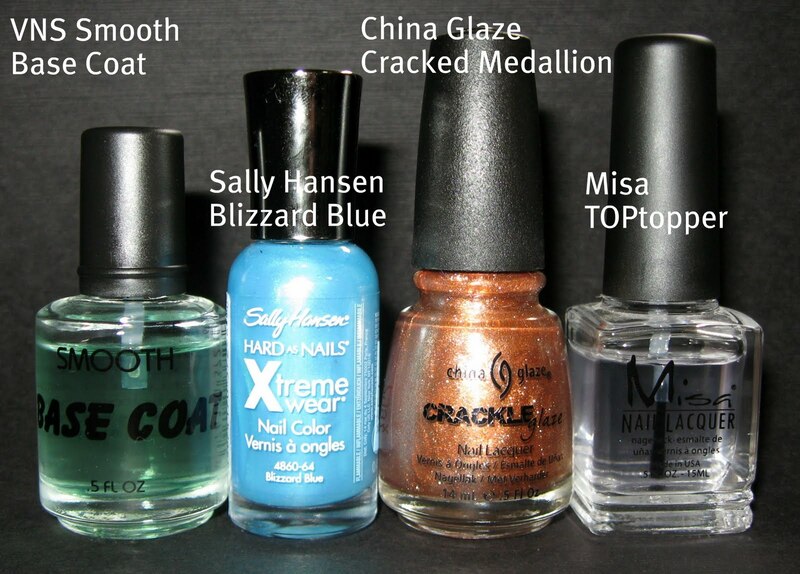 China Glaze has done a great job with this collection! I definitely think these apply much easier than their creme version, and I prefer them to the Sally Hansen crackles and some of the OPI crackles. They're just the right consistency, so you don't need too much on your brush. I've played around with all of the shades, and I love their sparkle factor. Are you tired of the crackle look, or are you going to pick up some of these? *The China Glaze product was furnished for review. Hmm, I also pictured this one over blue, great minds think alike! :D I'm usually not into these type colors, but for a possible effect I'm willing to make an exception. This is such a pretty combination. I like the metallics. The micro-shot is mind-blowing. I am eager to get my new metallics. I lvoe how the cracks look with this one! Now I'm excited! I love the way the color combination looks! I'm definitely going to pick up a few. The blue and gold looks great! I like these better then the first CG crackles that came out. I love the color combo, Mary! What a win of a manicure!!! Medallion is my fav shade of this CG metallic crackle collection hands down. GREAT idea to base it with that fab SH Blizzard Blue from the X line. I am RUSHING to find the SH shade...which is funny as I am saturated with lighter blues/teals/turqs of late - but this one really grabs me and I NEED it. 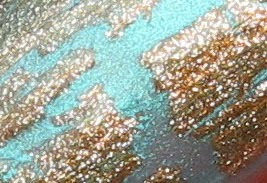 I also am happy with the CG new crackle collection - something about a metallic base coat for a cream crackle or now with the metallics coming in from crackles/shatters - it's (for me) the only way I can really love the somewhat over done crackle frenzy. I have a funny feeling it's super pop now - and is going to fall by the wayside within a year and end up looking like a dated trend no matter the color.